There is much more to Keoni Texeira’s game this season than setting career bests in points and goals two-thirds of the way through the Western Hockey League campaign. Yes, the defenseman from Fontana has become an integral part of the Portland Winterhawks’ lineup. That has happened in large part, he says, because he has found a comfort zone and expanded it during his four seasons of Major Junior. Texeira’s development hasn’t come as surprise to Portland assistant coach Oliver David, a California native himself who coaches the team’s defensemen and penalty kill. “He doesn’t take a day for granted,” David said. “How he goes about his business, you start to understand why that translates onto the ice. Above all, he really wants to be good and really wants to be a hockey player. That passion is obvious – it oozes out of him. 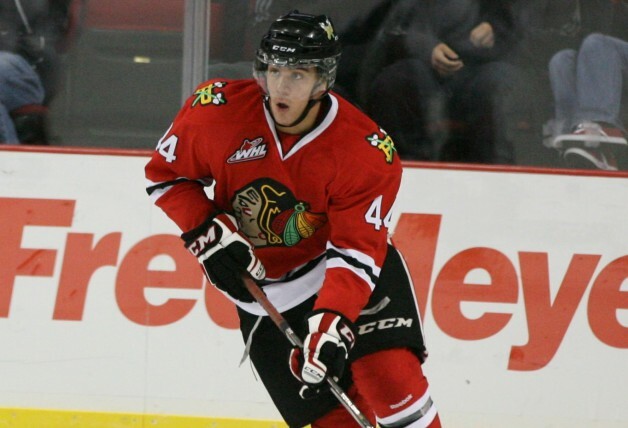 Texeira, who is one of the Winterhawks’ alternate captains, has progressively seen his role increase in what is typically a stacked Portland back end. Former teammates Matt Dumba (Minnesota) and Derrick Pouliot (Pittsburgh) are in the NHL and current teammate Caleb Jones (Edmonton) could join them (as well as his brother, Seth, another former Winterhawk) there soon. “When I first came in (back in 2013), we had unbelievable talents, and it was easier for me to play defense,” Texeira said. “Everywhere I looked, someone was open. One question hovering over the 6-foot, 213-pound Texeira is when he will move on, and to where. There is no question he will move on, David said. A 1997 birth year, this is Texeira’s final year of eligibility for the NHL Draft. He attended the Washington Capitals’ prospect camp in 2016 and performed so well he garnered an invitation to the main camp. “I’ve talked to a few teams throughout the year,” he said. “They’ve been good conversations and they’ve told me things to work on. There is high interest from a couple of teams. If he doesn’t, he should expect to generate plenty of interest as a free agent, David said. The timing of when he would sign a pro contract will determine whether or not he returns to Portland for his 20-year-old season. Texeira’s increase in scoring (34 points through 51 games) isn’t by accident. Not only is he receiving more power-play time this season, but he focused on fine-tuning his offensive skills that accompany his heavy shot. “I’ve been working on being more aggressive and being up on the rush,” he said. “I worked a lot on my shooting over the summer. Expect his patience to be rewarded one way or another at the next level.